Ring of Combat 59 Weighin Results | Lou Neglia's Ring of Combat | Next Generation of Mixed Martial Arts! 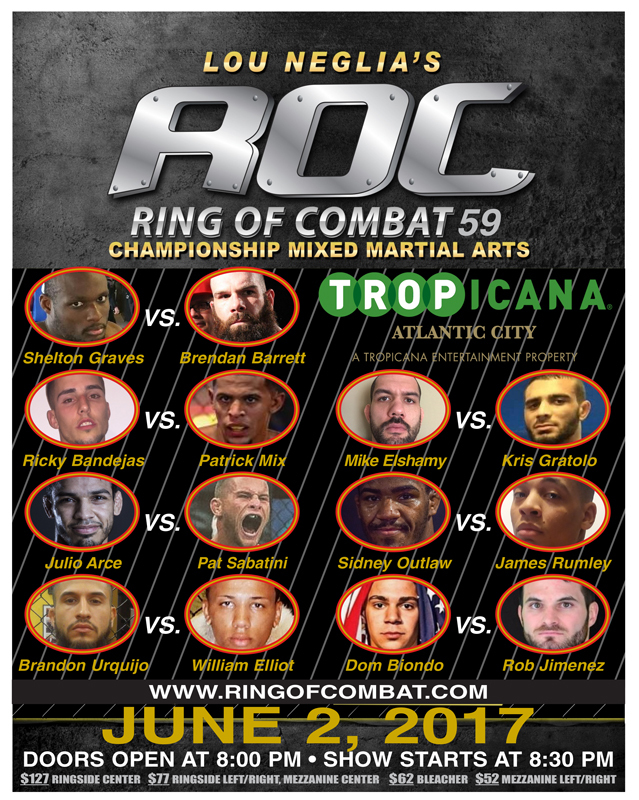 Five title fights highlight Ring of Combat 59 for Friday, June 2nd at the Tropicana Showroom in Atlantic City, New Jersey. If that isn’t enough, UFC head honcho, Dana White along with Matt Serra and Din Thomas bring their hit web series Lookin For A Fight to personally scout the talent on this massive card. The main event features a rematch between current champion, Shelton Graves taking on the man he won the title from, Brendan Barrett. Co-main event features ROC’s first ever two-time champion, Julio Arce, taking on Tim Dooling. Champions collide when current ROC bantamweight champion, Merab Dvalishvili, takes on Victory Fighting Championship bantamweight champion, Raufeon Stots (VFC title not on the line). Sidney Outlaw looks to make history at ROC 59 when he attempts to become the first ever dual ROC champion when he takes on James Rumley. Sidney is the current welterweight champion and now goes for the lightweight title. Rounding out the title bouts are Brandon Urquijo vs William Elliot for the regional bantamweight title. Follow @ringofcombat on Twitter for live results.